Many of us dream about a summer house by the sea; a place where we can while away the long, sun-kissed days in comfort while reestablishing a much-needed connection with nature. Anti Reality, an imaginative page which blurs the lines between art and architecture, has visualized a perfect concept of just such a place. The standout feature of the aptly named ‘Summer House’ is the roof. Inverted into a concave form, it creates a basin that is just perfect for a pool, so you can relax with a glass of something and watch the sunset over the sea. 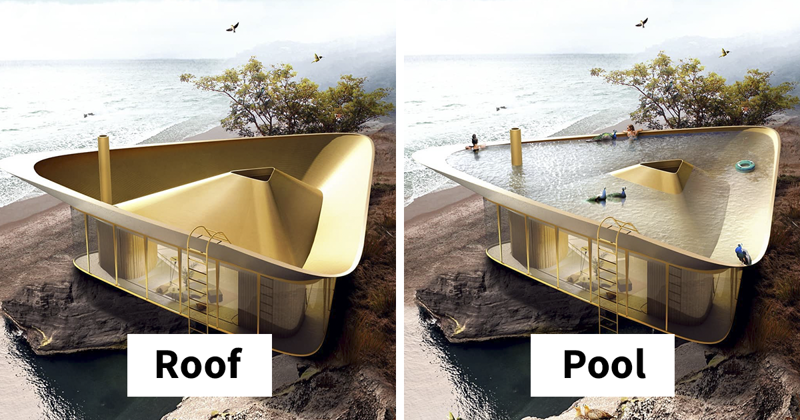 The pool is accessed by a ladder on the exterior of the house, which is designed to be perched on the edge of a cliff. Anti Reality has several futuristic and imaginative designs, visualizing a world of limitless opportunities for architecture. We can only hope that some ambitious engineers begin to take note! Author, add your add a link to your blog/webpage/profile and get more subscribers!